Leisel (www.leisel.net) is a small village (650 inhabitants) and is located on the sou th side of the National Park Hunsrück-Hochwald (www.nationalpark-hunsrueck-hochwald.de). The village has a small restaurant with a limited menu (closed on Monday and Tuesday). A few times a week, a baker comes to Leisel, in Schwollen (2 km) is a bakery. 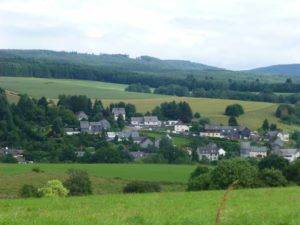 For shopping you have to go Niederbrombach (5 km, supermarket) or to Birkenfeld or Idar-Oberstein. In these towns is a variety of shops, restaurants, cafés, etc. For lovers of hiking, cycling or mountain biking, motor or car tours, fun activities with or without children, this is an ideal place. 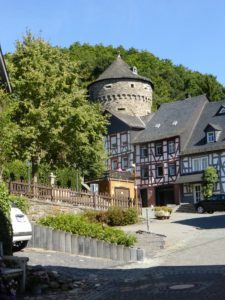 Within a radius of 30 km you will find both culture, with Idar-Oberstein, the gem city, as the focal point, and adventure at e.g. Erbeskopf, with a summer toboggan run and a rope climbing park (from simple to very advanced). In winter you can also skiing, tobogganing and cross-country skiing. The area has many historical towns with museums, for instance Herrstein with more than 60 restored half-timbered houses in the old town. Everywhere you can find the traces of the Romans and the Celts. And of course a visit to the gems and ore mines is a must. In Tiefenstein you will find the only historic water-powered gemstone grinding factory. Near Leisel is the chapel of Heiligenbösch, built on the foundations of a Roman villa. Next to the chapel is a restored Roman garden and you can take a walk on the Sironaweg between Leisel and Schwollen with statues of Roman gods and goddesses.